Tangerine post-production house is currently working on Sideline’s new reality series, ‘Head Chef’, for TV3. Presented by Michelin-starred celebrity chef Conrad Gallagher, this series aims to put eight finalists through their paces as they demonstrate their skill, determination and passion to kick-start their culinary careers and become Ireland’s next Head Chef. The first episode will air on Friday 8th April at 9.00pm on TV3. 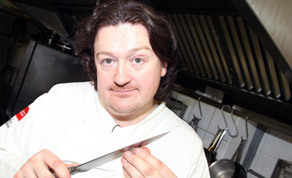 ‘Head Chef’, directed and produced by Sideline Production’s Billy McGrath (Take Me Out) was shot almost entirely on XDCAM with multiple Sony EX3 cameras. This tapeless format allowed a seamless workflow from receipt of the data from set, editing in parallel in two edit suits in full HD to online, grade and masters utilising the power of the UNITY system. Editor Dan Gannon (Take Me Out, Special 1 TV) and Tangerine senior editor Michael O’Sullivan (Families in the Wild, Model Scouts) will be working together over coming months to edit the 8 X 46-minute weekly programmes. Commissioned by TV3’s Ben Frow, the eight-part series is produced by McGrath and Tony Brady (The Panel, Take Me Out) and the director of photography was Ross O’Callaghan (Only Fools Buy Horses) with Meave Hackett (Hollywood Trials) and Keith McCormick as shooter AP/directors. The series shot in March of this year. ‘Head Chef’ will start its broadcast on Friday, April 8th at 9.00pm on TV3.